Sony recently launched the Sony RX100 IV and the Sony RX10 II to the Cyber-shot RX family series and I had the opportunity to have a look and a short hands on experience with the new functions and capabilities of the Sony RX100 IV and Sony RX10 II. The two new models feature the world’s first 1.0 type stacked Exmor RS™ CMOS sensor with advanced signal processing and an attached DRAM memory chip. The high speed signal processing and DRAM memory chip work together to enable more than five times the readout rate of image data and are responsible for a variety of standout features that have previously only been available in selected professional-level video cameras. These impressive capabilities include 40x super slow motion video capture at up to 960fps, an ultra-fast Anti-Distortion Shutter with a maximum speed of 1/32000 second, high-resolution 4K movie shooting and more. “Utilising Sony’s decades of expertise in digital imaging, we’ve made it possible for everyday customers to enjoy a professional imaging experience with the new RX100 IV and RX10 II cameras. With the power of the world’s first 1.0-type Stacked CMOS sensor packed into a compact, portable body, these new cameras bring the excitement and creativity of high frame rate shooting, 4K recording and a variety of other pro-quality features to a whole new audience.” said Kimio Maki, Senior General Manager of Digital Imaging Business Group for Sony Corporation. A first for Sony consumer cameras, the new RX100 IV and RX10 II both have the ability to record super slow-motion videos of up to 40x slower than the standard rate, allowing users to capture and replay fleeting moments of action with incredible detail, resolution and clarity. Prior to shooting, users will have the ability to choose among 960/1000fps, 480/500fps and 240/250fps frame rates and among 60p/50p, 30p/25p and 24p playback formats4 to optimise the recording to fit the speed of the moving subject. They also have the option to use the movie record button as a ‘start trigger’ to begin recording once the button is pressed, or ‘end trigger’ to record footage up until the button is pressed. The ‘end trigger’ mode lets shooting begin two to four seconds before the movie button is pressed, enabling shooters to capture the decisive moment with much more consistency and accuracy. The impressive speed and power of the 1.0 type stacked Exmor RS™ CMOS sensor with an attached DRAM chip allows the new RX100 IV and RX10 II to perform exceptionally well while capturing fast-moving subjects. In particular, its fast processing capability results in continuous speeds of up to 16fps on the RX100 IV, and up to 14fps on the RX10 II for an extended period of time. Additionally, the ultra-fast readout of the image sensor is responsible for the high speed Anti-Distortion Shutter (maximum speed of 1/32000 second), which allows the new cameras to capture sharp, crystal clear images with a wide open aperture at brightness levels up to EV19. It also minimises the “rolling shutter” effect commonly experienced with fast moving subjects. This allows photographers and videographers to capture beautiful content with sharply focused subjects and defocused backgrounds under some of the most difficult, bright lighting conditions. The new RX100 IV and RX10 II models are the first Cyber-shot™ cameras to offer the advantages of 4K (QFHD 3840×2160) movie recording5. The cameras utilise full pixel readout without pixel binning to ensure that all the finer details of 4K video are captured with minimal moire and ‘jaggies’. These high-quality results are achieved through the use of the XAVC S codec, which records video at a high data rate of 100Mbps during 4K recording and 50Mbps during full HD shooting5. The capacity for shooting 4K differs slightly on each of the two cameras, as the more professionally-styled RX10 II can shoot 4K videos at extended lengths of up to 29 minutes, while the more casual, pocket-friendly RX100 IV can shoot 4K clips of up to approximately five minutes in length. Furthermore, professional caliber video features on both of the new cameras include Picture Profile, S-Log2/S-Gamut, and more. Both cameras also have advanced dual video recording functionality, allowing shooters to capture 16.8-megapixel still images during 4K video recording in any of 11 different composition patterns, simply by pressing the shutter button. The new RX100 IV maintains the compact, pocket-sized design of the RX100 family, and has a ZEISS® Vario-Sonnar T* 24-70mm (35mm equivalent) F1.8-F2.8 lens, while the new RX10 II has the same body design as the original RX10 and feature a ZEISS® Vario-Sonnar T* 24-200mm (35mm equivalent) F2.8 lens. Each of the camera is equipped with a new high-contrast XGA OLED Tru-Finder™ with approximately 2.35 million dots of resolution, ensuring true-to-life image preview and playback functionality. The RX100 IV continues to have the convenient retractable EVF with ZEISS® T* coating from the RX100 III model that debuted last year. Both new models feature an upgraded Fast Intelligent AF system that enables high-speed, high-precision contrast detection of a moving subject in as little as 0.09 seconds. Sony’s proprietary AF algorithm allows them to recognise and lock-in on a subject with a simple half-press of the shutter button at a much more efficient rate compared to previous models. The new cameras are also Wi-Fi and NFC compatible, and has the ability to access Sony’s growing range of PlayMemories Camera Applications. More information can be found here: www.sony.net/pmca. Aesthetically, both of the new models feature a variety of customisable controls and buttons to fit the style of any shooters. 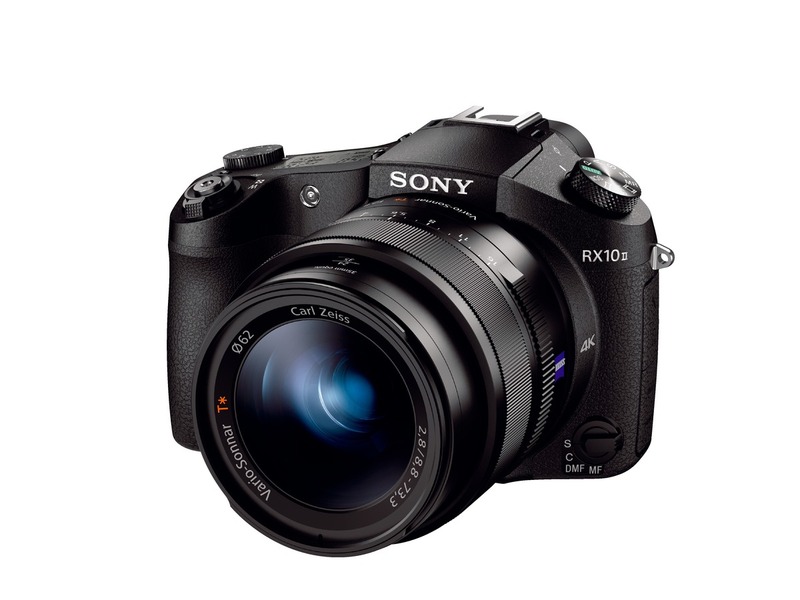 The RX10 II further adds dust and moisture resistance. A new stylish soft carrying case, LCS-RXG has also been introduced. Made of quality natural leather and available in brown and black colors, it is an ideal complement to the sleek designs of all the RX100 series cameras including the new RX100 IV model. 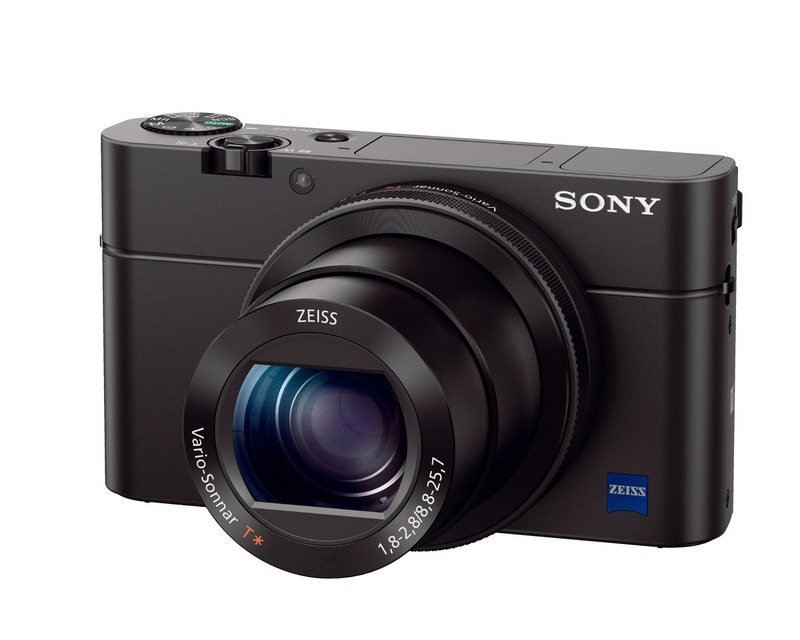 Starting from 3 July 2015, the new Sony Cyber-shot™ RX100 IV will be available for pre-ordering at all Sony Stores, Sony Centres, and selected authorised Sony dealers. All pre-orders will come with a Leather Carrying Case (LCS-RXG) and a 64GB High Speed SD Card (SF-64UZ). 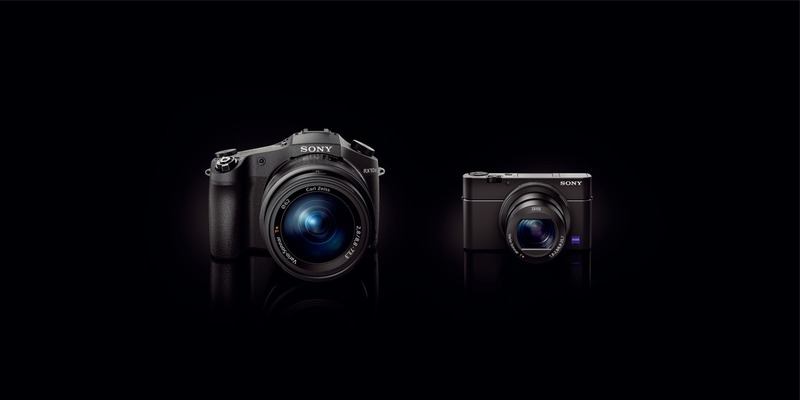 A variety of exclusive stories and exciting new content shot with RX cameras can be found on www.sony.com.sg/microsite/rx/ from 14 July 2015. This is Sony’s new community site built to educate, inspire and showcase all fans and customers of Sony imaging products. Visit www.youtube.com/c/imagingbySony and www.sony.net/product/di_photo_gallery for a full preview of videos and still images shot with the new Sony Cyber-shot™ RX models. Achieved by using overlay burst shooting. Configuration method/Access method: WPS or manually/infrastructure mode. When connecting to smartphones, the camera can always work as a base without a wireless access point. (Security: WEP/WPA-PSK/WPA2-PSK). For access to all of the latest Sony camera news on twitter, please follow #SonyCamera. The world’s first 1.0-type sensor with memory-attached design, as of announcement date from a Sony survey. 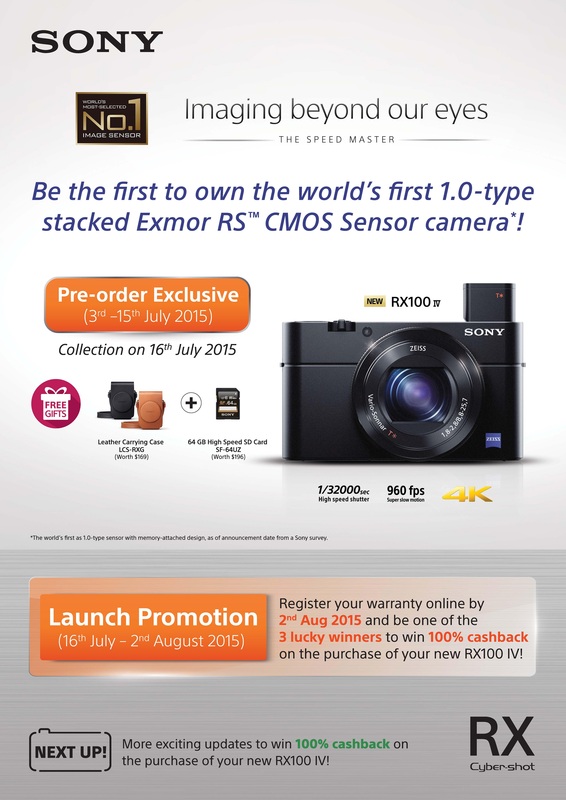 Compared to previous RX100 III and RX10 models. According to a simulation of the same electronic shutter of up to 1/32000 sec. combined with the Exmor R CMOS sensor employed with RX10 or RX100 III. Sound cannot be recorded when shooting slow motion. An SDXC memory card of Class 10 or higher is required. In NTSC. An SDXC memory card with a Class 10 or higher speed rating is required for XAVC S recording, while UHS Speed Class 3 is required for recording at 100Mbps. For reference, two seconds of movie footage shot at 960fps and 24p will take approximately 80 seconds to play back. Measured with RX10 II model, CIPA standard, internal measurement, at 8.8mm (Wide), EV7.0, Program Auto, AF area: Wide, in NTSC mode.